A credit report is exactly as the name suggests—a report on an individual’s creditworthiness. Credit reports have your identification, employment record, payment history, inquiries from other creditors, and certain public information, such as bankruptcies and tax liens. Consumers have the right to access their credit reports under the Fair Credit Reporting Act. The three major companies who track credit reports—Trans Union, Experian, and Equifax—are required under federal law to give consumers a free copy of their credit report once every 12 months upon request. 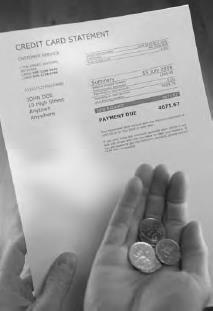 Consumers can also pay a small fee to obtain a copy at other times. Federal law sets the maximum fee at $11. Also, the Fair Credit Reporting Act provides that if a fraud alert is placed in a consumer’s credit report, that consumer can have two free credit reports within the next 12 months. Credit bills can easily sneak up on consumers, and with high interest rates and fees, many Americans can quickly find themselves buried in debt in a matter of months (iStock).